Walking from my car to work this week I stepped on some ice and suddenly I was skating with one leg behind me Nancy Kerrigan-style, then sliding on my right thigh like a baseball player and finally doing a break dancing-type spin move on my rear. When I stopped moving I was facing the opposite direction with my purse, work bag and lunch sprawled out on the pavement. My first thought was not about the mud on my pants, whether the man behind me saw the whole thing, or even the weird "Eeeeeeee" sound I had made the entire time I was falling. Nope, what I thought about first was whether my lunch was okay because I had brought leftover cashew chicken from the night before. That's how good this dish is. There is a lot going right with this meal. It's veggie heavy, which I love. It uses a good amount of fresh ginger, which I also love. The chicken is just stir-fried, not battered and fried. I love that too. 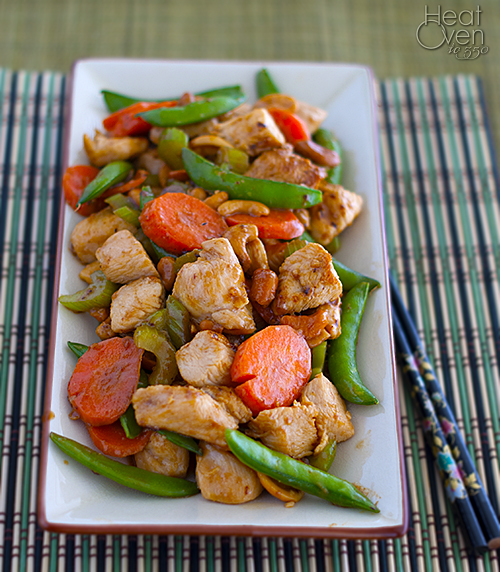 I love the choice of veggies, the flavor of the cashews mixed with them, and the simple sauce that is easy to make but tastes wonderful. I also love that making it takes no time at all. With so many things going right for it, it's no wonder that I thought of it even before I was sure I hadn't broken anything in my fall. Or that the man behind me DID see the whole thing happen. In a medium bowl, combine the chicken, garlic, 1 teaspoon of the soy sauce, 1 teaspoon of the cornstarch, 1 teaspoon of the rice wine vinegar, 1/2 teaspoon of the salt, and the sugar. Stir to combine. In a small bowl combine the broth, remaining 1 teaspoon soy sauce, 2 tablespoons rice wine vinegar, and 1/2 teaspoon cornstarch. Heat a large wok or a 12 inch skillet over high heat. Swirl in 1 tablespoon of the oil and add the chicken, spreading evenly in one layer. Let cook undisturbed for 1 minute, letting the chicken begin to sear. 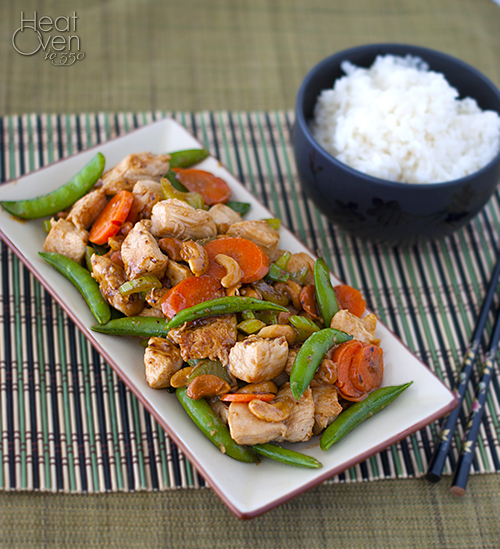 Add ginger and stir fry one minute, or until chicken is lightly browned but not cooked through. Swirl in remaining 1 tablespoon oil into the pan and add the sugar snap peas, carrots, celery and cashews. Sprinkle with remaining 1/4 teaspoon salt. Stir-fry 1 minute or until the sugar snap peas are bright green. Stir the broth mixture and add it to the pan. Stir-fry another minute until the chicken is just cooked through and the vegetables are crisp-tender. Serve immediately. I'm with you, I adore ginger and veggie heavy recipes too!! And cashews...oh my! Glad you didn't hurt yourself! One of the many hazards of winter! oh man! I slipped on ice recently too. Really made me wish I had taken up ice skating as a kid! This sounds absolutely lick your plate clean delicious! Oh no! I totally fell up the subway stairs the other day...I kind of saved myself but people definitely saw. At least you had a graceful fall ;) Totally loving all the veggies you have going on in this dish! We just saw our neighbor take a major spill on some ice in his driveway yesterday. Luckily he was ok! I'm glad you and your lunch survived your fall :) Love the simplicity of this meal and the yummy combination of flavors.